Lee Ufan, From Line, 1982. Courtesy Pace Gallery. © 2016 Artists Rights Society (ARS), New York / ADAGP, Paris. Photo: Kerry Ryan McFate. Artifex Press is pleased to announce that it will partner with internationally celebrated Korean artist Lee Ufan to publish the Lee Ufan Catalogue Raisonné. The publication will establish the definitive inventory of works by the artist in various mediums, including paintings, sculptures, and works on paper. For nearly five decades, Lee Ufan (b. 1936, Gyeongsangnam-do, Korea) has traveled between South Korea, Japan, Europe, and the United States, and created an internationally recognized body of work that draws from all of these influences. Lee first came to prominence in Japan in the late 1960s as the key theoretician of the Mono-ha (“School of Things”) group, who criticized modernism for viewing the world through abstracted representations. In his sculptural works, titled “Relatum,” Lee juxtaposes natural and industrial materials, usually stone and steel, and encourages a phenomenological encounter between the viewer, these objects, and the surrounding space. 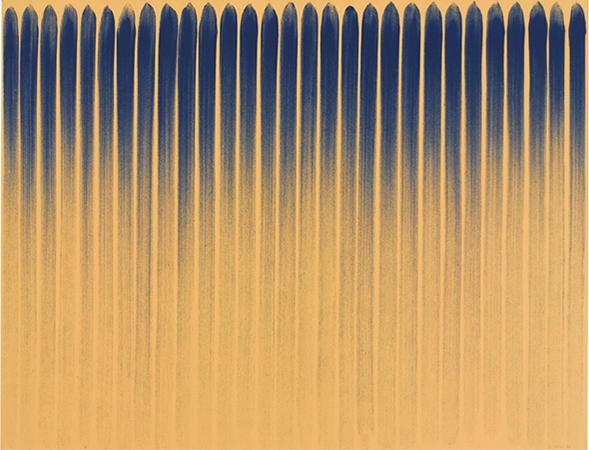 Beginning in the 1970s, Lee developed his iconic “From Point” and “From Line” series of paintings, whose repetitive marks across the canvas record the passage of time. In his recent paintings series titled “Correspondance” (1991–2006) and “Dialogue” (2006–), Lee uses a wide-tipped, flat brush to apply broad rectangular strokes on a large white canvas. The painted and unpainted areas suggest the metaphysical relationship between being and nothingness, evoking a sense of infinity. Lee Ufan has been the subject of more than one hundred solo exhibitions, including a career retrospective at the Solomon R. Guggenheim Museum, New York, in 2011, and a major presentation of site-specific works at the Château de Versailles, France, in 2014. Works by Lee are in the collections of the Museum of Modern Art, New York; Centre Georges Pompidou, Paris; Tate Modern, London; the National Museums of Modern Art in Tokyo and Kyoto; and the National Museum of Contemporary Art, Seoul, among other public institutions. The Lee Ufan Museum, designed by Tadao Ando, opened on the island of Naoshima, Japan, in 2010. Lee was a professor of art at Tama University in Tokyo from 1973 to 2007, and has authored numerous critical texts throughout his career. He lives and works in Kamakura, Japan, and Paris. Further details about the Lee Ufan Catalogue Raisonné are forthcoming. Artifex Press is a publisher of digital catalogues raisonnés. We have developed a proprietary, patented software platform and a dedicated publishing program in order to create digital catalogues raisonnés of leading artists. The Lee Ufan catalogue raisonné joins an expanding list of partnerships between Artifex Press and leading artists, artist estates, and artist foundations. To date, Artifex Press has published catalogues raisonnés for Chuck Close, Jim Dine, and Tim Hawkinson, and has several more in progress, including those for Carl Andre, Robert Irwin, Sol LeWitt, Agnes Martin, Niki de Saint Phalle, and Frank Stella.